Out of the few existing App Inventors, ThunkableX has its own distinctive features. Apart from being able to create a common source program (block) for Android and iOS, I have focused on the newly introduced Cloud Variables. They extend the scope of traditional variables to cloud space based on the real-time database Firebase. Normally, Firebase is created with a user-specific id, but if you know its url, you can access its cloud variables. If someone authorized updates the value of the variable, the event would be immediately received by other apps. This enables efficient development of database applications and the like. An example of initializing cloud variables is shown in Fig. 1. You will see that Firebase tags can be mapped to cloud variables. Hierarchical tags can also be cloud variables, for example, “fireLoc/lat”. After initializing these cloud variables, they can be referenced in several ways. Fig.2 shows five access blocks for the cloud variable Betty. In particular, I would like to focus on the block called “when cloud Betty initialize or changes”. Using this block makes it possible to know the update of the cloud variable in real time, and to easily configure the application logic based thereon. Gram app is a well-known example of using cloud variables. 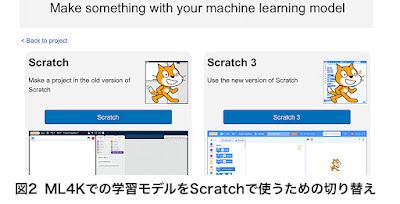 This is a very nice app, but for general programmers it is somewhat complicated. So, I created a simpler demo app. 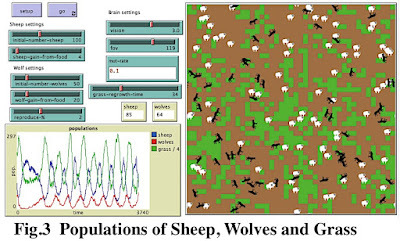 Fig.3 illustrates that. Jack would like to know the current location of his daughter Betty in real time. However, Betty allows the location information to be transmitted only when she presses the button of her smartphone. 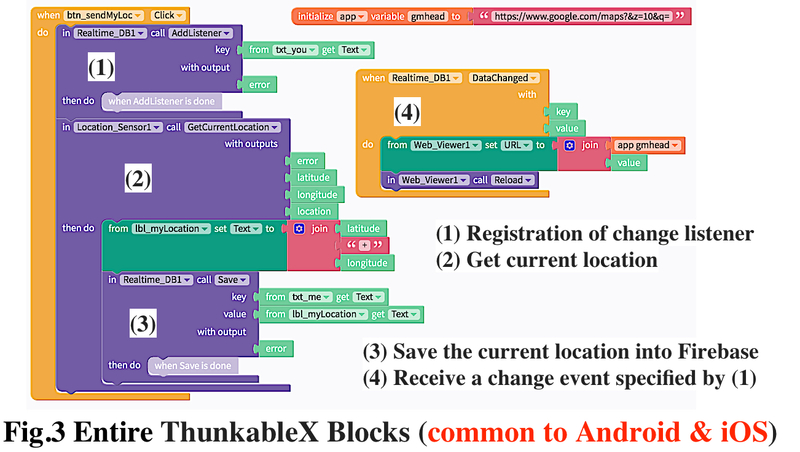 The complete block diagram of ThunkableX that realizes this is shown in Fig.4. Fig. 4 (a) is for the sender Betty, and Fig. 4 (b) is for the receiver Jack. 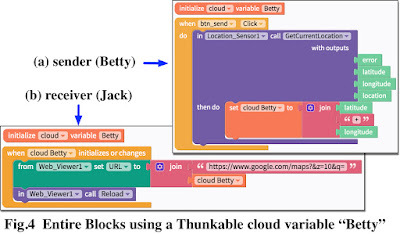 This figure shows that using cloud variables makes programming very easy. In fact, you can access the contents of the database without using any Firebase blocks (registering listeners, storing values ​​in the database, etc.) at all. 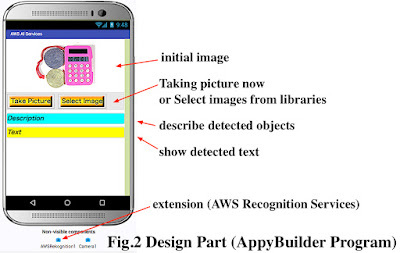 In the Fig.4(a), location information is obtained by GetCurrentLocation, and is stored in the cloud variable Betty. Also, in Fig.4(b), since the update of the cloud variable Betty is automatically detected, the result would be reflected immediately on the map. ThunkableX  is a kind of software system of App Inventor, which makes it possible to create a common source program for Android and iOS. Some of its functions have not yet been realized, but it is a wonderful system that continues to progress. Here, we created a simple GPS demo program using ThunkbleX. Suppose Jack and Betty want to show each other the current location on the smartphone in real time. 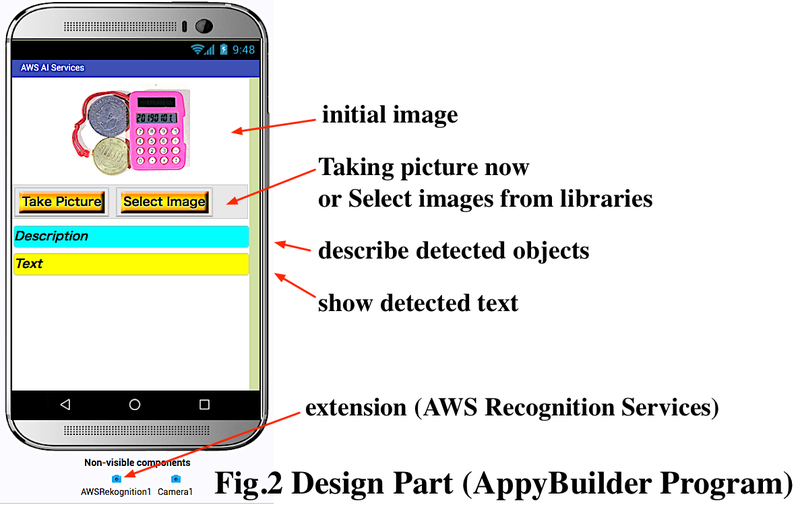 In fact, the MIT App Inventor program that realizes it is shown in the literature . 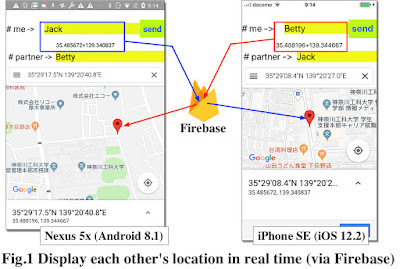 It uses the real-time database Firebase, but it is assumed that both have Android devices. By contrast, this article assumes Jack has an Android device and Betty has an iPhone. I created a ThunkableX app like Fig.1 below. 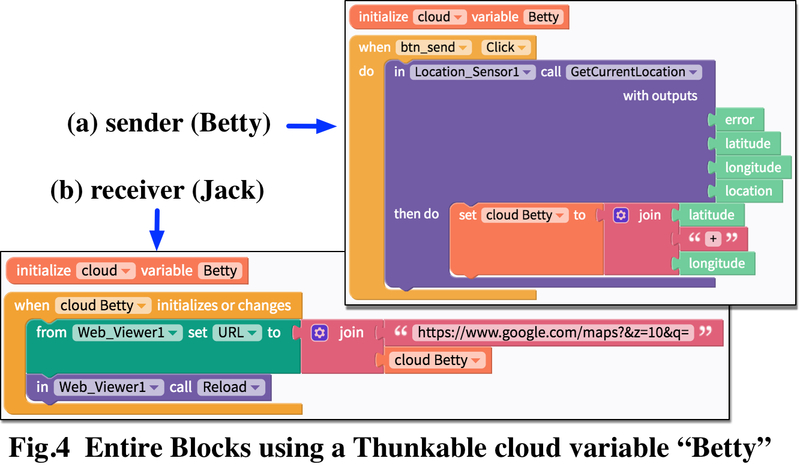 The source list (block configuration) of the app used here is common to Jack and Betty. Through Firebase, the current positions of each other are displayed in real time. When you press the send button, your location information will be stored in Firebase. 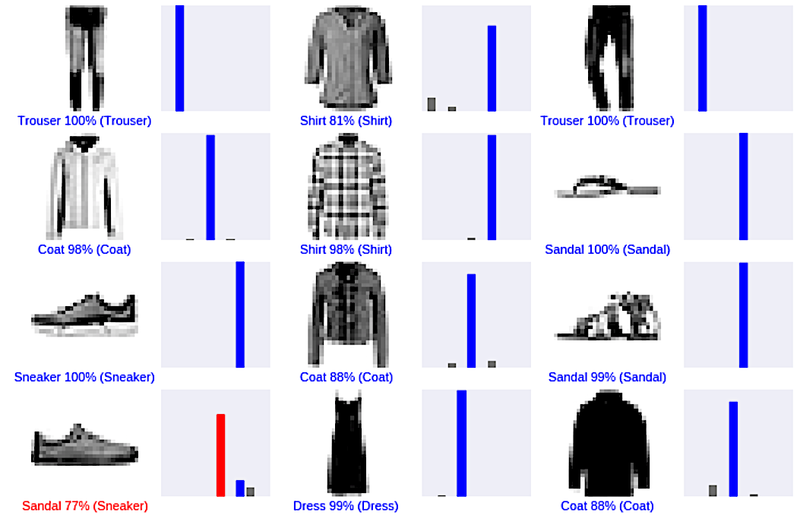 Fig.2 shows the contents of Firebase. 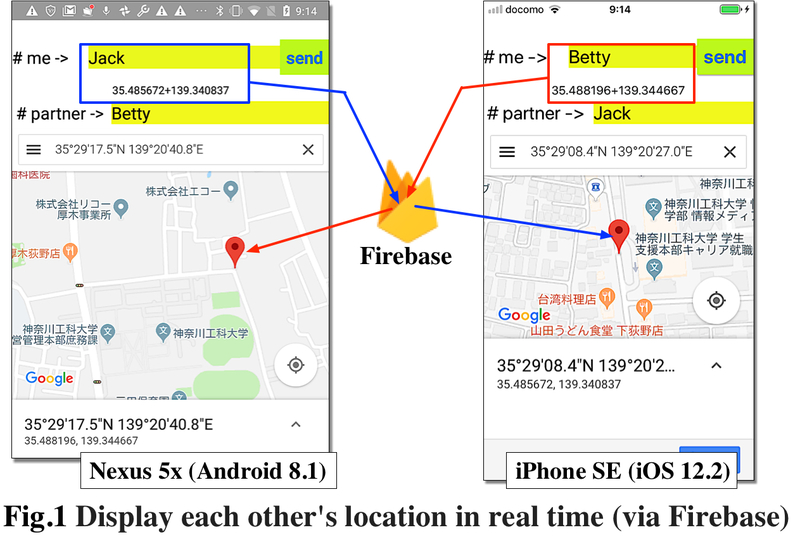 If there is a change in the Firebase, the opponent's smartphone immediately updates the map display by seeing the change event in real time. The whole block of ThunkableX which realizes this is shown in Fig.3. In the case of reference , registration of the listener for change event as shown in Fig. 3 (1) was unnecessary. On the other hand, the reason ThunkableX needs it is probably because of the commonality with iOS. When you use Firebase, you do not need to make any settings if it is a temporary test program. However, if you use it in a full-fledged app, you will need to set up your own Firebse Database URL and API Key. Otherwise, security issues may occur. Modern AI image recognition allows us to recognize not only objects, but also the accompanying text (strings). 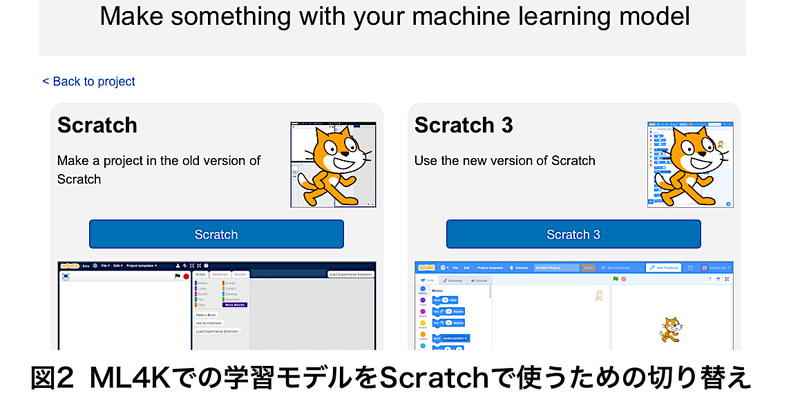 Here we will try it using Amazon AWS Rekognition. Using the APIs provided there, we can create a variety of applications on our PC, but for more convenient use, the applications on our smartphone will be preferable. Recently, I focused on the AWS AI Services Extension developed by Ceyhun Özgün. This is an Extension that allows MIT App Inventor applications to easily take advantage of such recognition features. References  and  provide descriptions and demo programs. I've created a simple smartphone application like Fig.1 below, using this useful information as a reference. Let me illustrate the recognition results in this diagram. Fig.1 (a) is an image of the US $2 bill. Immediately, “Money, Person, Dollar” was recognized. 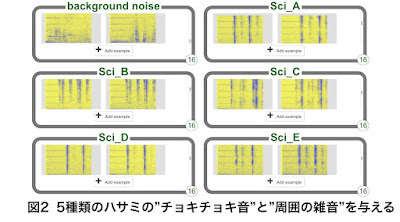 In addition, the text in the image was also recognized. 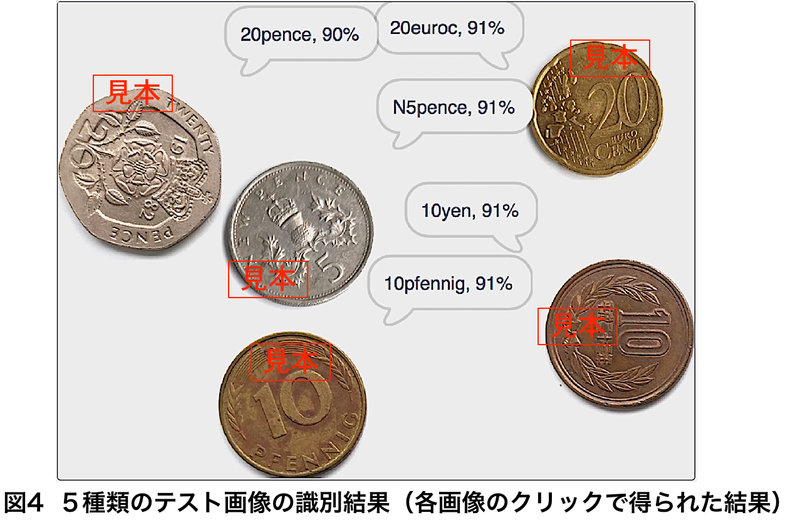 In particular, the number “J045... 5A”, which is the id of the banknote, is also recognized precisely. Fig.1 (b), on the other hand, is an image of a notebook and books. It is recognized as “Book”, and the text of the titles of the books (although handwriting is also included) is almost accurate. I think it's great. These smartphone apps are fun to use wherever you take them! 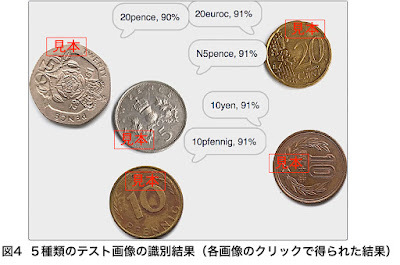 The design part of this app is shown in Fig.2. 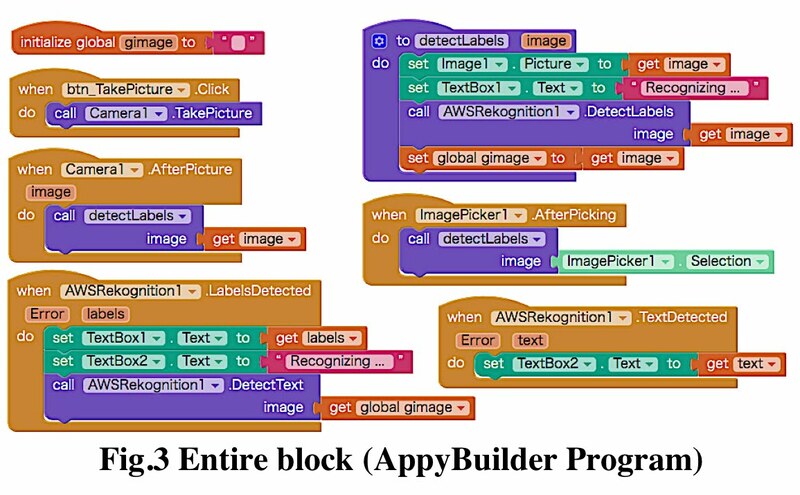 Here, I used AppyBuilder. You can choose to take a picture now or use an image that you already have in your library. 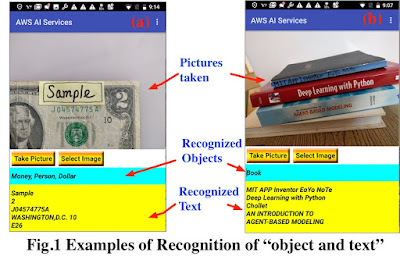 After that, recognition is performed automatically and the results of recognition of objects and text are displayed. 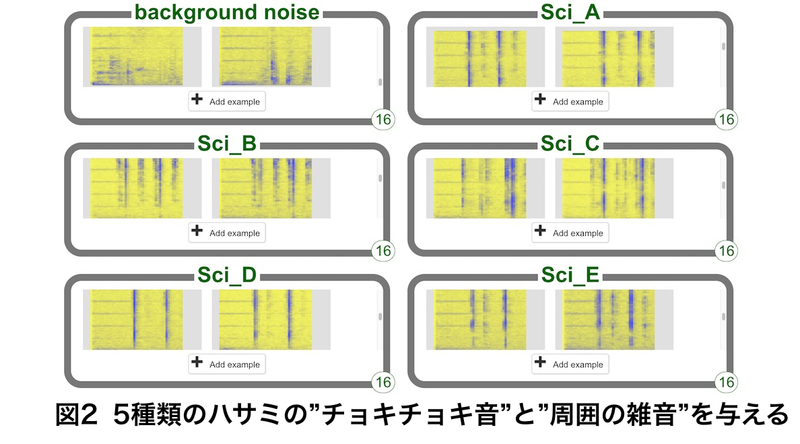 Next Fig.3 is the complete blocks of this app. 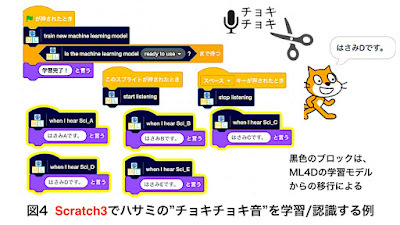 Thanks to the Extension mentioned above, you will find that it has become a very concise program. In order to use this Extension, you need to set up an AWS account. In particular, be aware that you will give your AWS Services credentials on the first run. Details of this are also described in the literature . Thanks to Ceyhun Özgün! In the last article, I took an example using NetLogo's anonymous procedure (Lambda expressions). This time, as a continuation, I show another simple example. The problem is to find out pairs of right parenthesis and left parenthesis in multiple parentheses structures, as shown in Fig.1. The parentheses structure is given in a text format to the variable paren as shown in (a). The actual structure is as shown in (b). The result of detection of the pairs of left and right parenthesis is illustrated in (c). This problem can be easily solved using a stack, as is well known. Here, referring to the documents  and , as shown in Fig. 2, the stack is represented by a list, and the operations of push and pop for it are given by lambda expressions (line 4-line 5). In pop, use the procedure getLast to get (and then to remove) the top element from the list. So far, it is still in preparation. The actual parentheses check is performed by the foreach in line 5. First, please pay attention to "runresult paren". The variable paren is given the text as described above, but this input form has the ability to create this into a lambda expression for converting text to list. Therefore, runresult is applied. As a result, this part becomes a list. Foreach works on each element of this list, that is, on "(" or on ")". The variable "n" in the lambda expression in line 5 corresponds to one element of the list. In the procedure "tinit", if the list element is "(", the value obtained by counting up the variable lpc is given to it as a label, and that element is pushed to the stack. On the other hand, if the list element is ")", get the label attached to the "(" at the top of the stack, and then set that label to the ")". This process determines the pair of parentheses. Since push is a lambda expression that does not return a value, it is evaluated by run, whereras, pop is a lambda expression that returns a value, so it is evaluated by runresult. Well, "(" and ")" are both turtle agents. 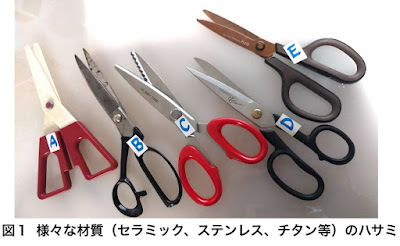 In order to display it in an easy-to-understand manner, the shape was defined independently. NetLogo provides a shape editor that allows users to freely define necessary shapes as shown in Fig.3. Let's take advantage of the anonymous procedure in NetLogo programming. This anonymous procedure is called lambda expression in other languages ​​such as Java. An example is shown in Fig.1. Thirty turtles are randomly arranged. Their types are red, pink and white. The problem is to connect the same colored turtles with a line, under the condition that only turtles of the same color in the range of radius 3 are targeted. 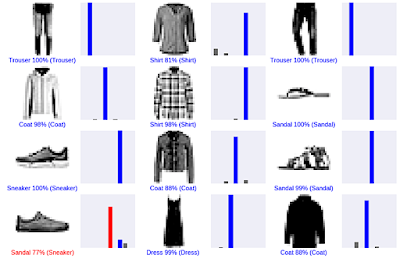 The result is shown in the figure on the right. There should be various NetLogo code to achieve this solution. Here, I created a source program like Fig.2. 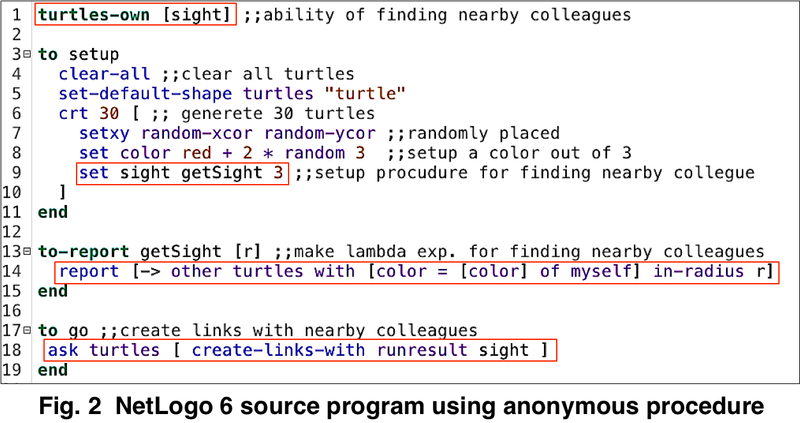 I added sight as a new property of turtle (Line 1). This is to give turtles the ability to detect the existence of other turtles around them. This sight is given detection capabilities by calling procedure "getSight 3" (line 9). Here, "3" means to detect within the range of radius 3. This sight is quite different from other properties, such as color. The value of color is a constant like "red + 2", but the value of sight is an anonymous procedure (or lambda expression) as shown in line 14. That is, in the setup procedure below, the value of sight is not determined, but instead a method is given to determine it. 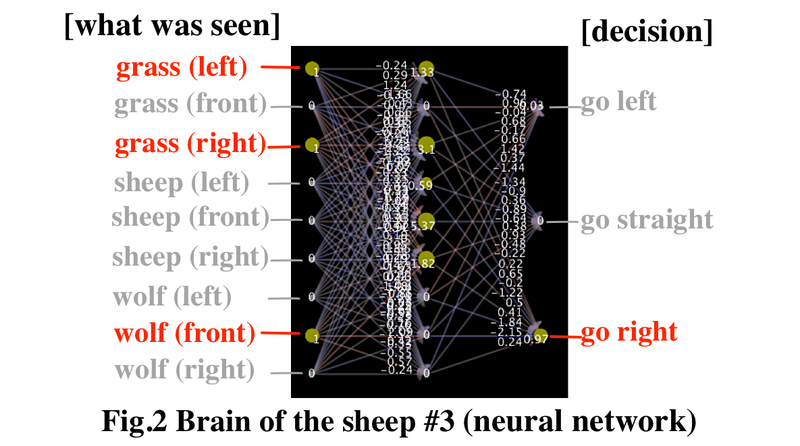 The specific value of sight is determined in the go procedure. 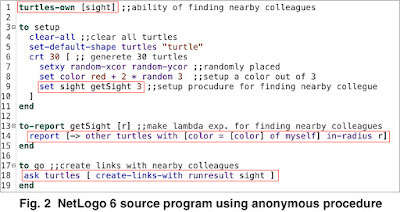 The command "runresult sight" (line 18) evaluates the lambda expression sight here. The result should be a set of turtles of the same color, within a radius of 3. Then they are connected in a straight line by the command "create-links-with". Find out all the properties that turtles have. For example, Fig. 3 shows properties for the turtle whose id (who) is 8. As mentioned above, you can confirm that a "procedure (reporter)" is set to sight (at the last row) unlike other properties. In this way, you can handle the procedure as if it were a value, enabling flexible processing in various situations. 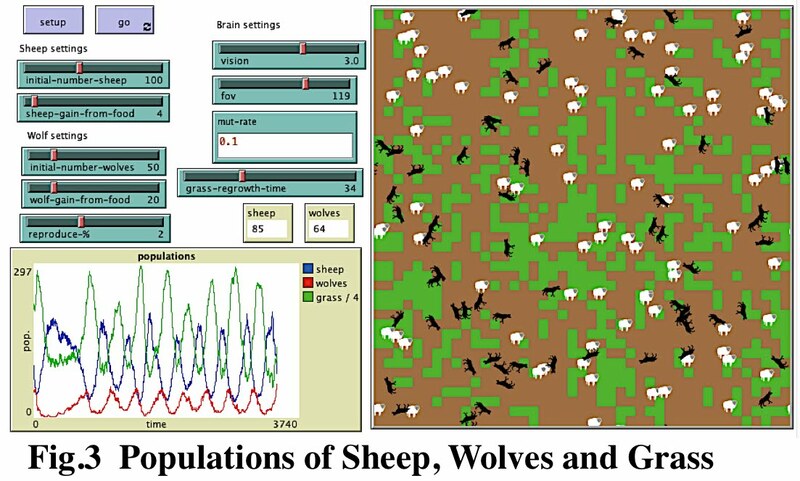 Bryan Head, Arthur Hjorth, Corey Brady, and Uri Wilensky, "EVOLVING AGENT COGNITION WITH NETLOGO LEVELSPACE", Proceedings of the 2015 Winter Simulation Conference, pp.3122 - 3123. FoYo. 「Awesome Inc.」テーマ. Powered by Blogger.